90 % of differentiation happens before the students enter the classroom…. planning! Rick Wormeli: Keynote on RTI and DI at the CLMS Annual Conference, Feb. 26-28, 2010, in Sacramento. This is an excellent clip to show your school staff. Rick answers the questions teachers are asking. This is a ‘must watch’ clip! So what is differentiated instruction? Visit the Instructional Rounds ning, go to videos and view Rick Wormeli’s clip. It’s worth the visit. 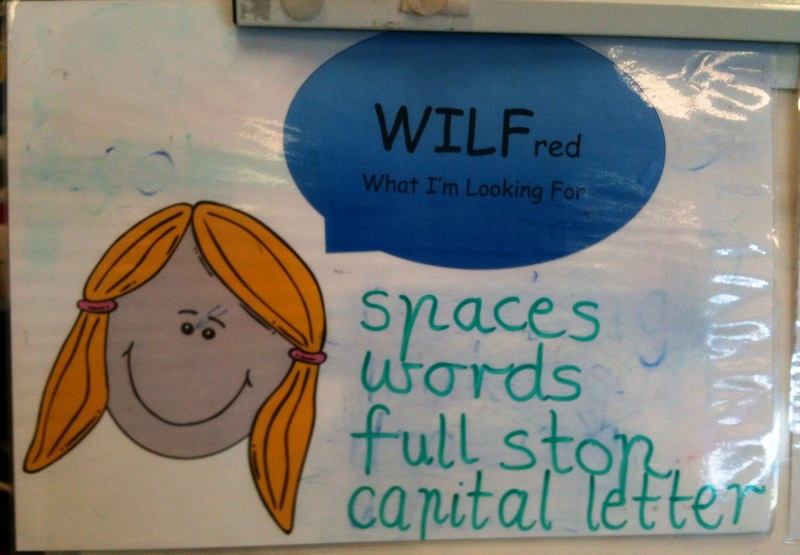 Week 4- Term 1 2012 Preps (5 Year Olds) are developing confidence and ‘having a go’ at writing. The school term is well underway and it’s busy. Each year I know my practise is changing. Having a clear understanding of what is explicit teaching and what is FUT (fill up time) enables me to clearly plan tasks which address the broad learning needs of this group (differentiate). 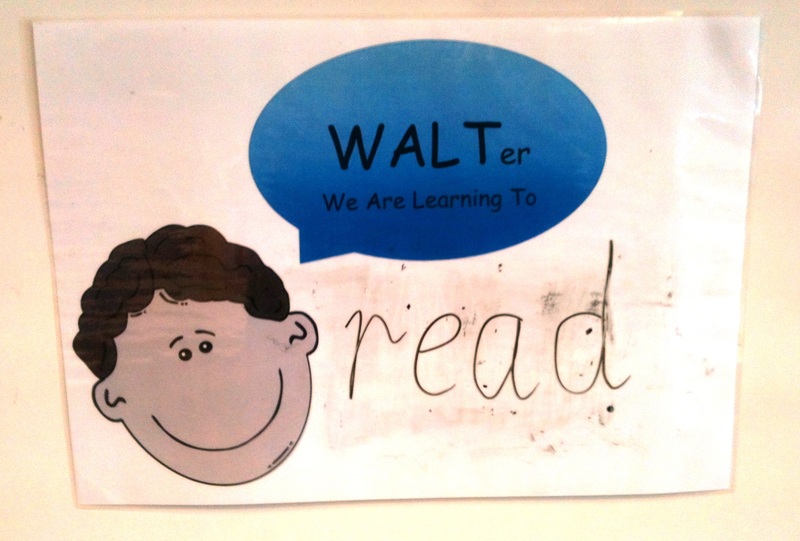 Introducing WALT – ‘We are learning to’ and this week WILF – ‘What I’m looking for’ is ensuring tasks are planned to move my student’s learning forward. 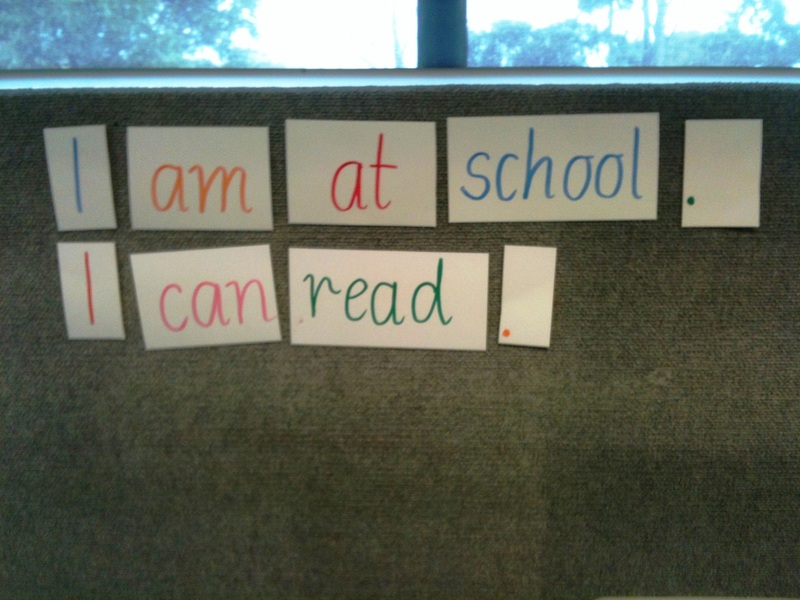 Our IB-PYP attitude focus is ‘confidence’, and being confident ‘to have a go’ is crucial for these young learners. Young writers (5&6 Year Olds) need confidence to put their pencil to paper and draw upon their existing understandings to record a simple recount. Taking the apprehension out of the task of writing requires discussion and trust on the part of the child that their effort will be valued. Constructive feedback is desired by this group. This age group continue to amaze me with their wise thoughts. They encourage each other, display persistence and ‘have a go’. 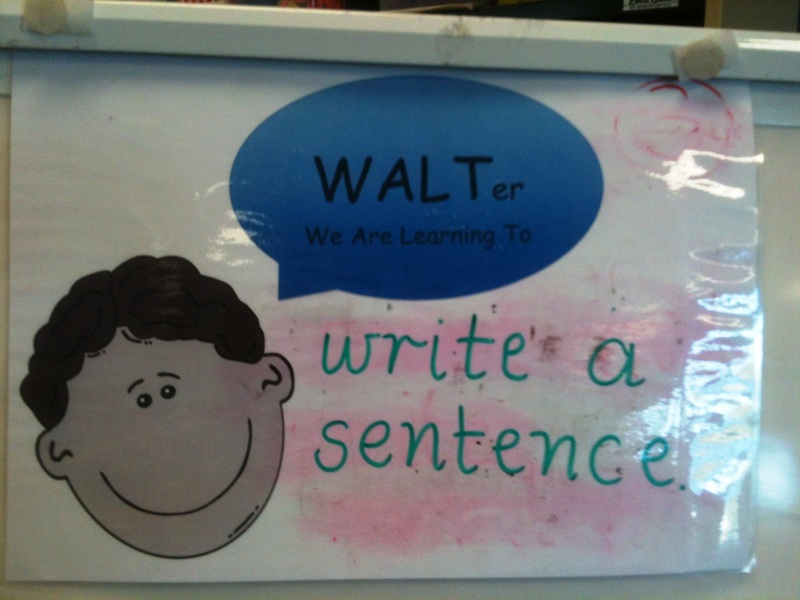 The writing examples provided evidence the transfer of learning. It’s the transfer of what has been taught that I am looking for. We are focusing on recounting an experience. International Baccalaureate (IB) – Prep Inquiry One: Who We Are…. Form: The understanding that everything has a form with recognizable features which can be observed, identified, described and categorized. Perspective: The understanding that knowledge is not constructed only from the perspective of a particular discipline, individual or group. 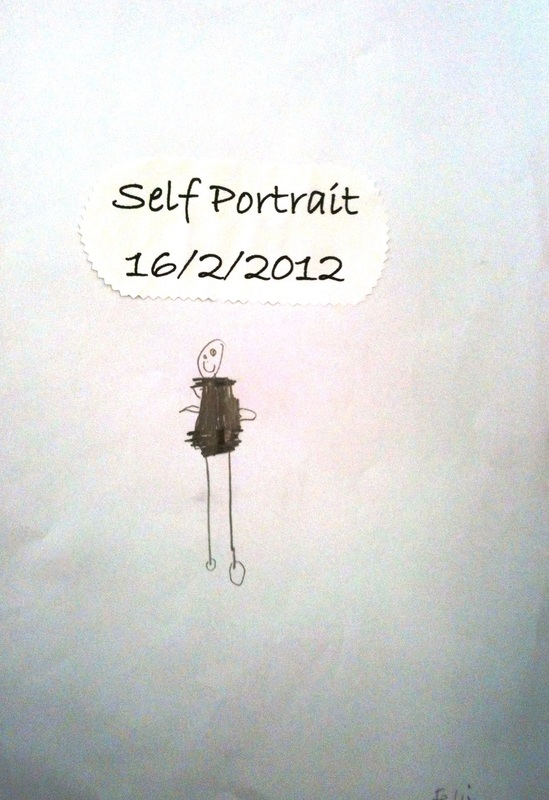 This week my Preps were asked to draw a self-portrait. They had to think about what they looked like and use grey lead to sketch themselves. Their self-potraits are beautiful. 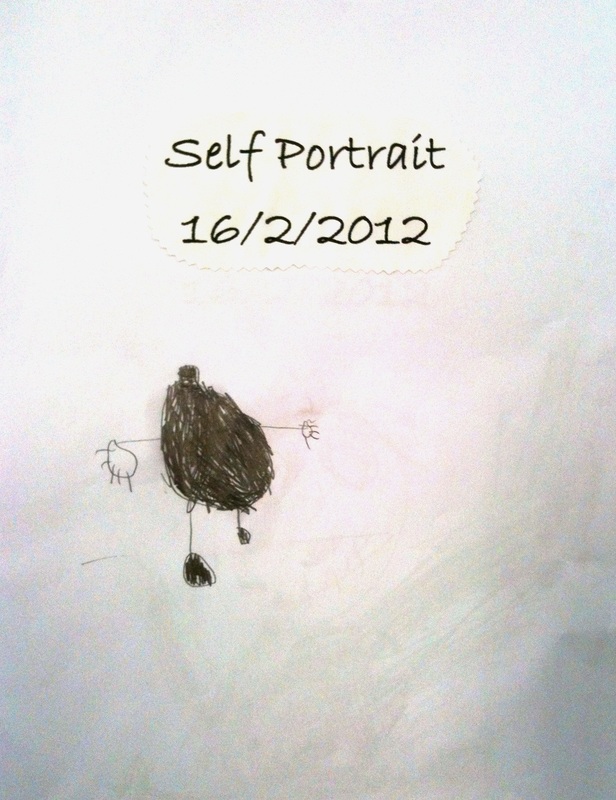 At the end of our inquiry my Preps will be asked to complete another self-portrait to display their new understanding of form. 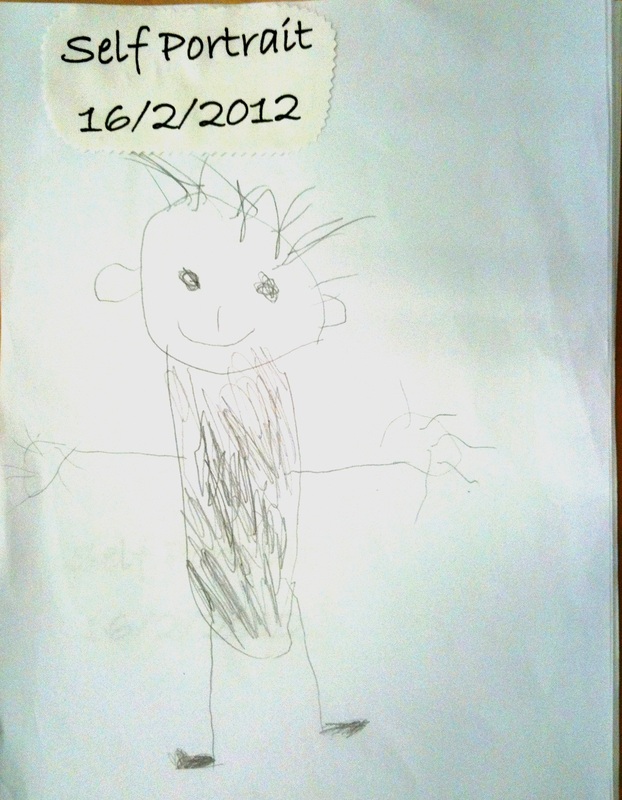 Today my Preps were given their first independent journal writing book. I could see the excitement… and apprehension on their faces. We talked about ‘having a go’, thinking about the sounds they could hear in words, looked at the alphabet tool card and revisted what a sentence, word and letter is. We talked about riding their bikes and how they had to practise. Some still had training wheels and others didn’t, but if they practised they’d get better and better. I always tell them that I’ve been writing a long time and I’m still learning and getting better. This impressed them! So knowing that they were going to have plenty of practise and that I would write out their sentence when they’d finished, every child had a go. I was impressed by their first efforts. 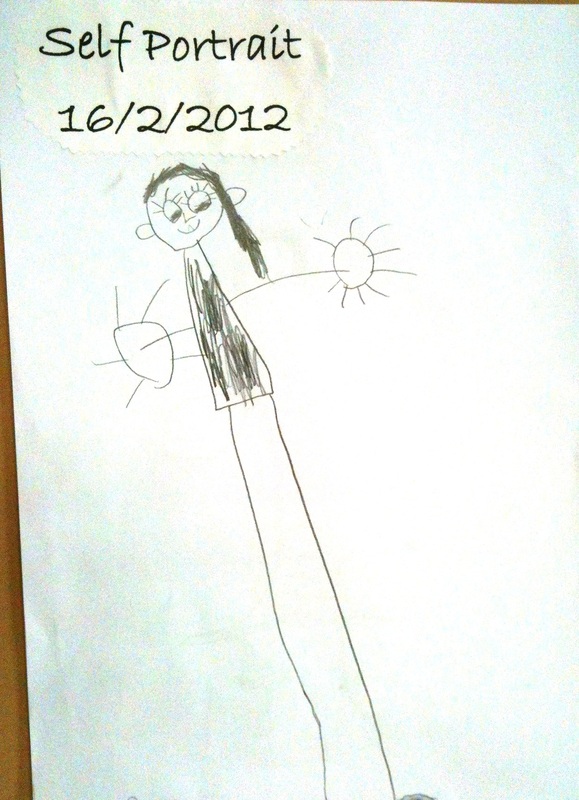 Week 1 of Formal Education in Australia – Prep (4&5 Year Olds) Language Experience: The tasks…. 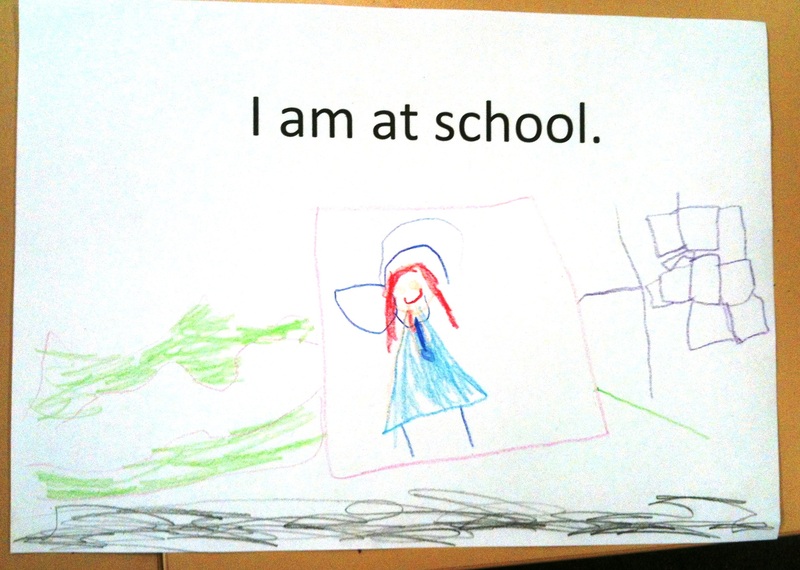 Last Monday my new Preps arrived at school excited and hoping they would go home reading and writing. I have to explain that it takes time, they’ll learn and I’ll teach them. I start right there and then. 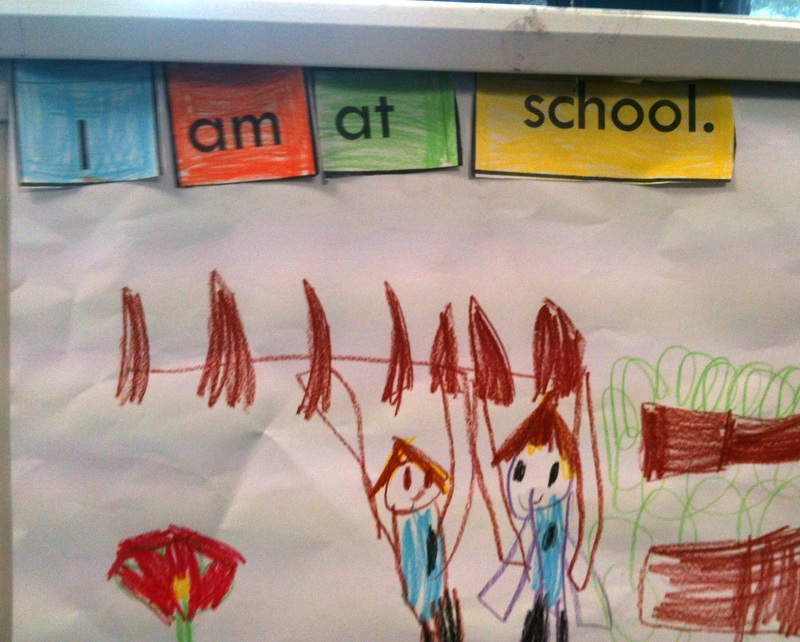 Our first Language Experience sentence is: I am at school. It’s amazing how much they already know about letters and words. We look at books, find sentences, discover spaces and full stops. The first writing strategy I use is Shared Writing. Their knowledge of the group is pooled together, someone will know a sound, and another child will know how to write the letter. It’s wonderful to see their enthusiasm for learning and excitement! 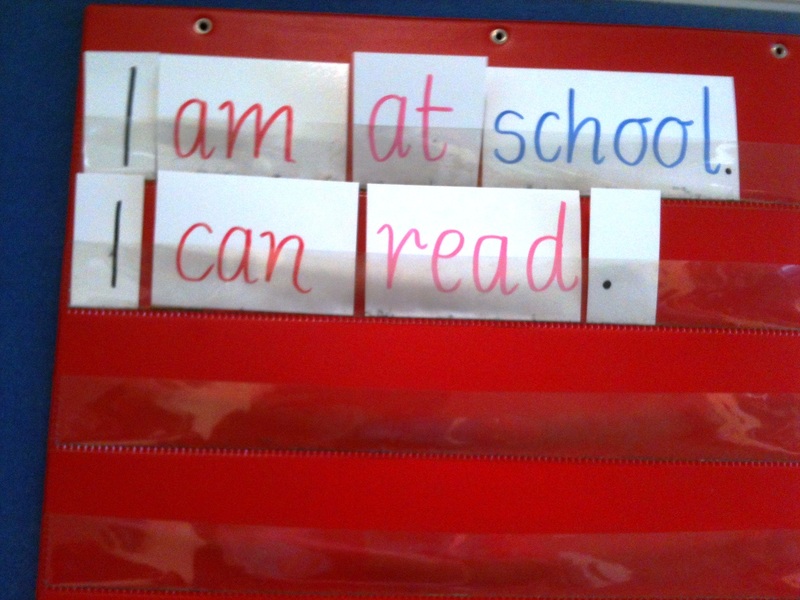 Our first sentence is written on sentence strips and placed in the sentence board and on the velcro board. We read our sentence, sound words and the children illustrated the sentence on a sheet they take home to read to their parents. The strategies used this week were Shared Writing, PrepD Student Led Interactive Writing, Modelled Writing, Read Aloud, Read to a Partner and Re-order the Text. Week 1 was very busy.